The active ingredient in Yentreve is duloxetine, a substance that improves the transmission of messages between the nerve cells. Yentreve has an effect on the nerves that control the muscles of the urethra. By making these muscles stronger, Yentreve makes it easier to retain urine. Hence, Yentreve is used to treat various forms of urine incontinence. 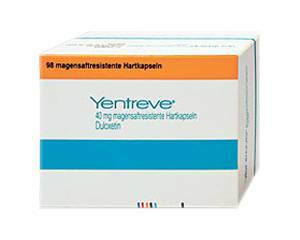 Yentreve is used to treat stress urinary incontinence (SUI). SUI is the accidental leakage of urine when pressure in the bladder is increased suddenly, for example by sneezing, coughing, laughing, bending or lifting. By increasing the tone of the urethral muscles, the frequency of episodes of leakage is reduced. Yentreve capsules should be swallowed whole. If you have a sensitive stomach, it is best to take them with meals to avoid stomach distress. It may take a while before Yentreve has the desired effect, so do not stop taking it if it does not seem to be working. Consult your doctor if the symptoms have not improved after two to four weeks. You should not suddenly stop taking this medicine, as this may cause withdrawal symptoms such as headache, nausea and difficulty sleeping. These symptoms can be avoided by stopping the medicine gradually. 40 mg, twice a day. The duration of the treatment is decided by the doctor. If you have forgotten to take a dose of Yentreve, you may take it as soon as you remember, unless it is almost time for your next scheduled dose. Never take a double dose to make up for the forgotten one. Gastrointestinal symptoms such as nausea, diarrhoea, stomach ache (usually only temporary). Little is known about the effects of Yentreve on the (unborn) baby. It is therefore important that you take this medicine only with the approval of your doctor if you are pregnant, planning to conceive or breastfeeding. Yentreve may affect your ability to react. Do not drive or operate machinery if you feel dizzy, sleepy or drowsy. Effects such as drowsiness or dizziness are made worse by alcohol. It is important that you are aware of this and reduce or stop your alcohol intake while taking this medicine.